Hello dear Jane. Are you well? I hope you are. I was so happy today when I found you Facebook. You know how hard it is to go on Facebook here. Actually, you probably don’t know. How would you?! It’s been a long time since the last time I wrote to you. My life seems to be moving faster than time itself. Last time I wrote to you I was planning to pack and come over to your country. Today though, I don’t know. Remember I wanted to go to New York, get a small apartment and live my life in serenity? You know how I love New York. It’s the best city in the world. Or maybe it’s not. As I wrote to, everything I know about New York is what I’ve learned from the show Friends. By the way, is your father well? Has he started any new projects? I bet he doesn’t know Iran yet. You had promised to explain to him that the war struck country he reads about is not us … we are the serene, lovable country next to that one. The one with a large population of young people who would love to have your father’s TV series be their actual lives. I hope you fulfilled your promise. Have you noticed that our countries are making finally friends? Remember you had bet there was going to be a war?! See! Didn’t happen! I wish it never happens. Now that I have stayed in Iran, I hope this friendship prospers and those in power let go animosity. Then we can travel to your country for holidays and you can come over here too. I promise if you bring your mother, I take her to Tabriz’s carpet bazaar and then to Isfahan. She will not want to go back to America. But for now these plans are still just all hopes and wishes. You know that if your uncle and mine don’t let go their stubbornness, all the good will and hope will be lost. I fear your brother replaces your mother as our guest and we serve one another with guns instead of sweets. You know it will be frightening and painful if your brother and I along with many other young people will have don those military boots and get killed because of the decisions made by the uncles wearing suits and sitting behind desks. I wish they understand each other. I wish they understand us. I’m sorry, I shouldn’t be writing about such upsetting things during the holidays. By the way, how is your sister? Will she become a doctor or the devil’s advocate? Sorry, I was joking. You know, I don’t get along that well with lawyers. I hope she is always well. This letter is getting too long. Pardon me, you know us Iranians, we love to chat. I bet you are decorating your Christmas tree now, or perhaps you have already done that. 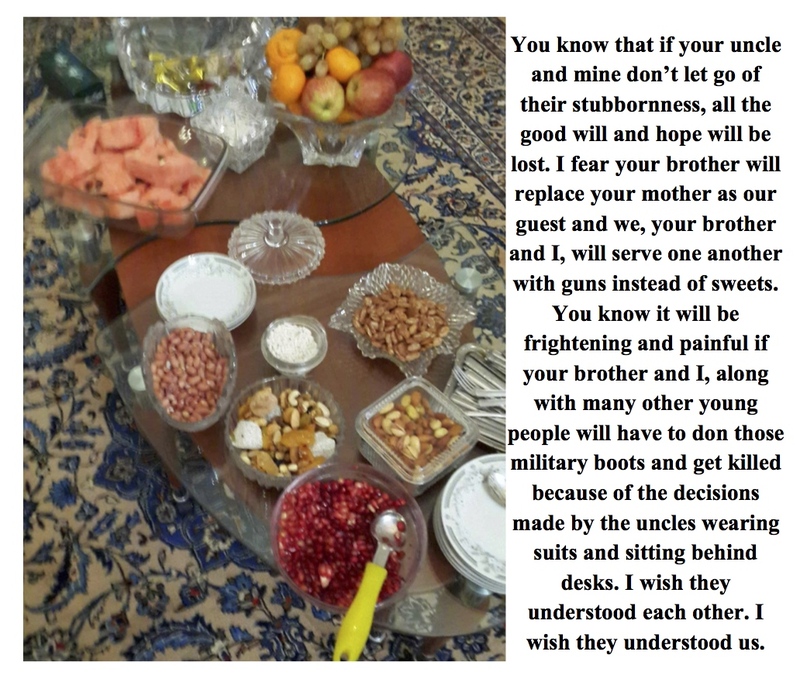 By the way, I am sending a photo of our traditional Yalda table. You remember Yalda, don’t you? The celebration that we hold on the longest night of the year, the one I explained to you that is the origin of your Christmas. Remember? The discussion you dozed off in the middle of it. Copyright Netformance 2013. All rights reserved.